The PD-Trak Project Portfolio Management System provides a high degree of flexibility to configure the software tool to your process. In addition, PD-Trak includes Best Practice-Based Process Templates that you can use to consider improvements to your process or use as a starting point to quickly define your process and implement this software tool. These templates may be adjusted to ideally fit your company environment and project needs. The Project Process Templates (PPT) define the standardized phase/stage-gate process that your organization wants all projects using this process to follow. Projects in PD-Trak are created from a PPT. 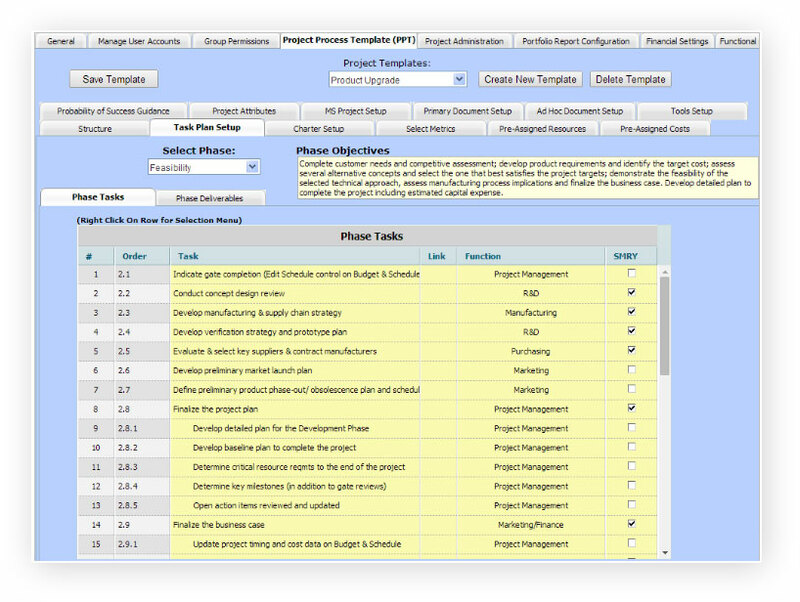 These process templates are highly configurable. Pages and tools can be turned off for situations where a simpler set of tools is required. Many elements are configurable including phase names, gates or milestones that separate each phase, tasks and documents/deliverables, functional ownership of tasks , document templates, metrics, pre-assigned resources based on the type of project process, etc. Multiple phase/stage-gate processes can be defined. For example, you can have a more comprehensive process for a totally new product; a streamlined version of this process for a product modification, product upgrade or product line extension; and a separate process for technology development or platform development project that does not directly lead to a new product. If a product has embedded software, you can have a process for software development and integration. 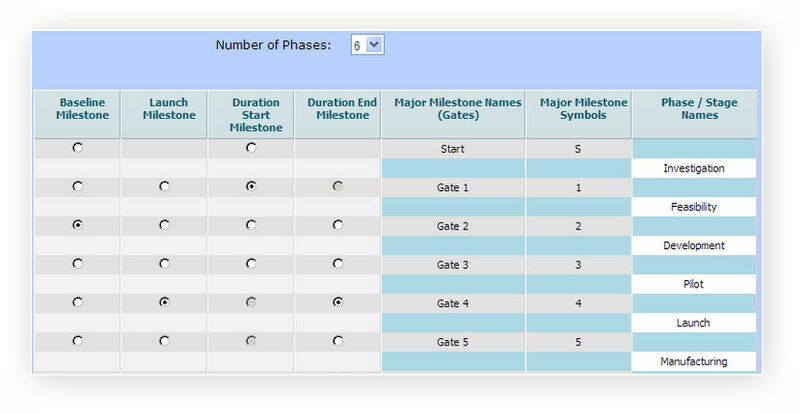 The phase/stage-gate process defines a sequence of phases and gates that each project must pass through, providing a roadmap for the consistent, successful execution of projects. Each phase has an objective statement, a set of required tasks and deliverables. This information helps organizations in three ways: 1) it minimizes the risk that the project team will overlook important tasks that are needed for project success, 2) it makes it easier to follow the defined process, and 3) it defines the points at which the management team will assess progress and make decisions whether to continue investing in the project. The process guides the project team to provide the information necessary to support this decision making process. Defining your new product development process begins with the phases and gates or milestones that separate each phase. Tasks, deliverable documents and responsibilities are defined within each phase. (The task details can be edited using an Excel download, a better environment for large scale editing). One of the areas that is most unique to individual companies is the business case which can be configured with different formats and terminology for different types of projects. Logic can be incorporated to calculate a business case based on the methodology defined by your Finance organization. Results can be based on calculating net profit, gross margin, EBITDA, etc. based on how financial factors are defined. Alternatively, we can integrate a custom Excel business case workbook using the precise model required by your company, with the ability to directly import cost data from the database and export resulting metrics to the database. Our project portfolio management software is a multi-currency system. The organization can designated a primary currency for portfolio reporting. A project that might be done in a foreign location can have a different currency designated and the project will be converted to the primary currency at the portfolio level. An individual resource can have its own unique currency and the currency will be converted to the project currency. This enables the software to support a global company with projects in different countries. There are many other aspects that enable the configuration of this project portfolio management system to your specific needs.